Coco's mother is a big admirer of Coco Chanel and so when she passes the name onto her daughter she knows the child is meant for great things as well. She even promises to give her a Chanel bag of her own when she's old enough, which her daughter can love and cherish for the rest of her life. But when she dies when the child is just 13-years-old, Coco ends up in the permanent care of her grandparents. And instead of leading an exotic lifestyle where she travels the world in search for unique items for the family's antique shop, just like her mother did, she grows up in a small village in England where the most exciting part of her day is a visit to the shop by a bus full of tourists. However, Coco is perfectly happy with her small-town life, she loves her grandmother and their shop and even though people always have certain expectations of the way she should look and act because of her exotic name, she's used to it by now and she doesn't mind being plain and often invisible. Though the one thing she sometimes misses from her life is a man to share it with. She had a long-time boyfriend, but when he moved to New Zealand she realised that while she loved him she wasn't in love with him and she didn't want to uproot her life to follow him half-way across the world. So instead she spends her days working in the shop, creating magical window displays and going to auctions in the hopes of finding new exciting items to sell on. One day she buys a marble topped table at an auction which has a box of junk on top of it. What she doesn't realise at the time though is that one of the items in the box will change her life forever. All the way on the bottom, hidden under a stack of old papers, lays a beautiful handbag, which looks like it's made by her namesake. And when Coco starts a mission to track down its owner she uncovers the beautiful story of Tatty's life and she meets some wonderful people in the process. I loved the premise of this novel. 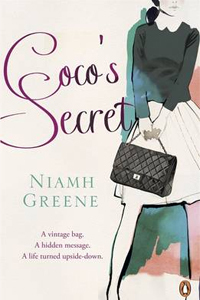 Author Niamh Greene takes an object as simple as a handbag and turns it into something extraordinary through Coco's journey into its past. Coco's honesty and curiosity lead her on a path with some interesting characters, to say the least. And through her discoveries she not only changes their lives, but they change hers in unexpected ways as well. And in the end, it is the Chanel bag her mother had promised her that changes Coco's small town life in the biggest way imaginable. The only thing that to me was missing was a conclusion to the letter Coco's mother wrote her all those years ago. Because of the other storyline surrounding a long letter I somehow expected it would resurface and give Coco the opportunity to hear from her mother one last time, so I was slightly disappointed when this didn't happen. Still, Coco's Secret is an otherwise wonderfully sweet feel-good novel with likeable and colourful characters and a magical touch. Many thanks to handbag.com for a copy of the novel in exchange for an honest review. My review of the novel can be found in a slightly different form on their website HERE.